Caretto|Spagna, on this occasion in the role of artists and curators, as it sometimes happens with the modality of their artistic practice, summarize in a rich set up the path – of study, meetings, narratives, organization, physical work – taken in these three months of residency in the Biellese territory. New works are displayed, aesthetic and critical fruits of an artistic research, deliberately left open and in the making, on an unexplored theme of which a story among many gets to be narrated, one that has never been narrated before: the one about Biella’s apple producers. The issue expands, and elements which belong to both the world of art and the universe of the apple as if mirroring each other are placed next to the tension between the local and the global, logical short circuits and unimaginable similarities. Diversity, memory preservation, collecting: these correspondences turn out to be the most interesting aspect of the project. 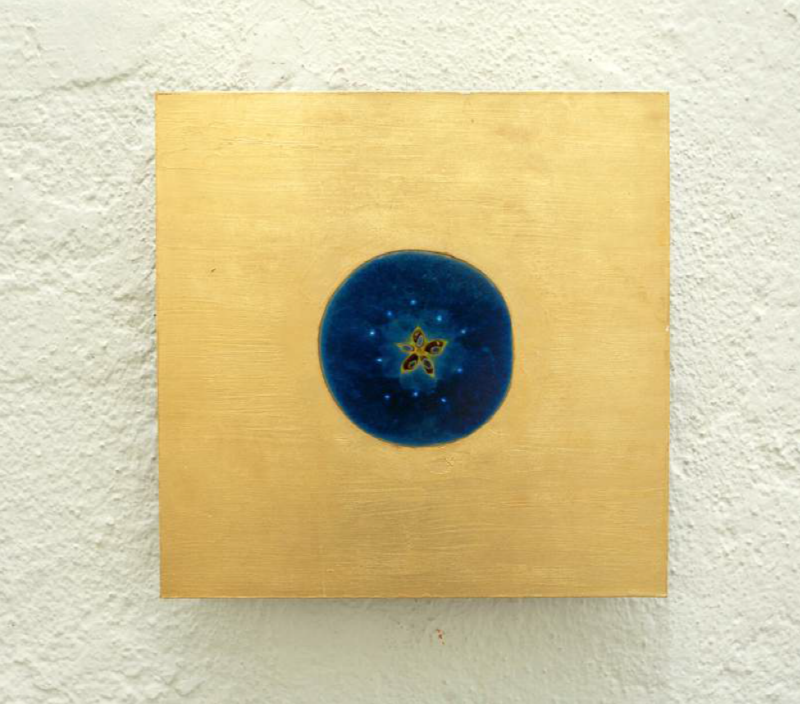 The apple represents a source of energy, expresses the possibility of life and it is a metaphor for art. The title I Malus refers to the Latin word used in botany to indicate the apple tree Malus, a genus which includes about forty species, among which is the Malus domestica (or Malus communis), the most common and among the earliest species of fruit trees domesticated by mankind. I Malus (which recalls, by assonance, the «i» of the technological society populated by iPhone, iPad, iMac, etc., as established by the company “Apple”) gives the name, and nominating, it confirms the existence of a subjectivity, allows the apple tree to speak, gives it the status of an organism telling its own story (one of many possible ones) from its wild origin to its exact opposite: the exasperated domestication typical of the industrial agriculture. The apple tree has accompanied the whole of man’s history, from the myth of Paris and Helen to the biblical episode of Adam and Eve in the garden of Eden, to the legendary deed of the skilful William Tell, to the well known Newton’s anecdote, to quote a few instances. The apple tree has been modified through a long work of selection, till it acquired features almost opposite to the ones of the ancestral wild apple tree, the Malus sieversii. This archaic species of Malus, originating in the Central Asia mountains and considered the progenitor of the domestic apple tree, was characterized by a strong adaptability, a long life, resistance to illnesses and fruits comparable to the best variety on the market today. The domestic apple tree, which, as the name says, has been domesticated, has progressively become weaker and weaker, easily succumbing to parasite attacks and with less than vigorous root apparatus, because of a selection which has privileged those features more suitable to a production on industrial scale for the global market. The exhibition is an attempt to tell the story of this evolution, as the subtitle A story of the apple says, to show the genus in its fragmentary and specific aspects rather than in its linearity, “spots” of an iconological, historical, biological, anthropological, naturalistic, procedural, expositive, material, narrative, commercial nature, and to summarize its essence through the languages, forms and practices of art. Image of the cross section of an apple, solarized, which shows the five chambers of the ovary surrounded by ten dots (the marks of the stamens of the flower). This starlike conformation delimits a pentagon inscribed in a decagon; the numeric constant of the golden section occurs in both polygons, expressing a generating principle which regulates many forms in nature. This image and its hidden geometry allow the in introduction of one of the key themes of the exhibition project: the shift from the particular/the Biellese territory to the general/the universal. The farmer and independent researcher Marco Maffeo, among the biggest experts on apples in Piedmont and a member of the “Let Eat Bi” network, takes on the challenge of trying to remember all the names of the hundreds of varieties of apples he knows. The work refers to the genetic, cultural and commercial memory linked to the farming of apples, and to the relationship between biodiversity and the utopia of a preservation of the variety unaltered. At the beginning Maffeo is relaxed and remembers the names without any problem, he then starts to feel the strain, to take longer and longer pauses, he struggles to remember, he resumes, and eventually gives up. Afterwards, he realizes that he has not mentioned some of the most common varieties, even if he knows them very well. In about thirteen minutes Maffeo mentions over two hundred varieties, even if he is familiar with many more, and their names accompany the public over their visit resounding in the exhibition space. 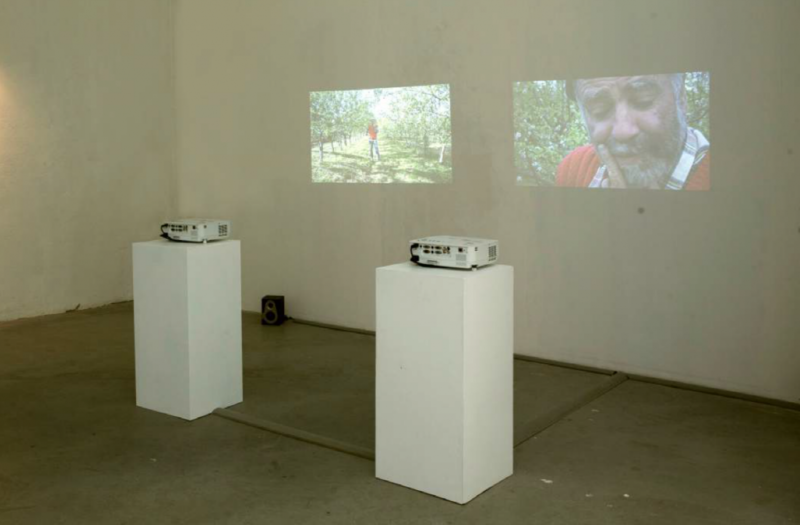 In the second video the protagonist is filmed standing still (as a watchman) in his experimental orchard, a sort of genetic bank of the ancient varieties of apples, where he farms and reproduces about 180 varieties. Through grafting, the farmer tries utopically to perpetuate the preservation of a genetic heritage into eternity, at the same time conveying the human effort to preserve the memory of places and traditions. The apple juice, hand pressed by the farmer Marco Matteo, transforms, through a series of fermentations, first into cider and then into vinegar, thanks to the colonies of yeasts and bacteria. 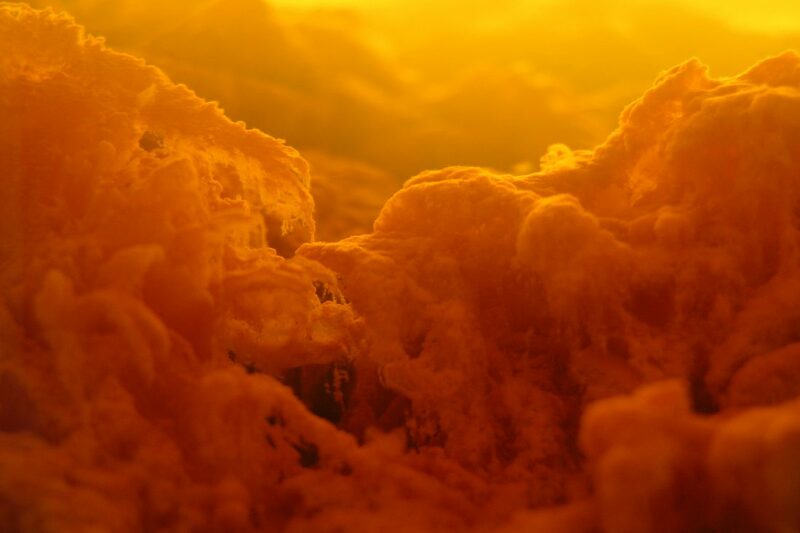 The gelatinous colonies of organisms, floating on the surface of the juice, are regularly removed and let to dry assuming the aspect of delicate parchment. A platform offering the public the opportunity to see the works displayed in the exhibition from a different point of view and to have an almost overhanging open view of the river Cervo, which the authors mean to visually incorporate into the exhibition space, with the intention of making the context an integral part of the expositive project. In this area visitors can consult printed documents, books, images related to the themes the artists have dealt with throughout the I Malus exhibition, and sit on the wooden seats facing the fluvial landscape, enjoying officinal herbs and apple infusions courtesy of the Cascina Torrine in Cavaglià. Seven apples belonging to as many varieties among the most common on the big distribution market are assembled to form a single abnormal organism which, during the months of the exhibition, will progressively deteriorate and transform, leaving intact only the protective shell made of paraffin and the external form. 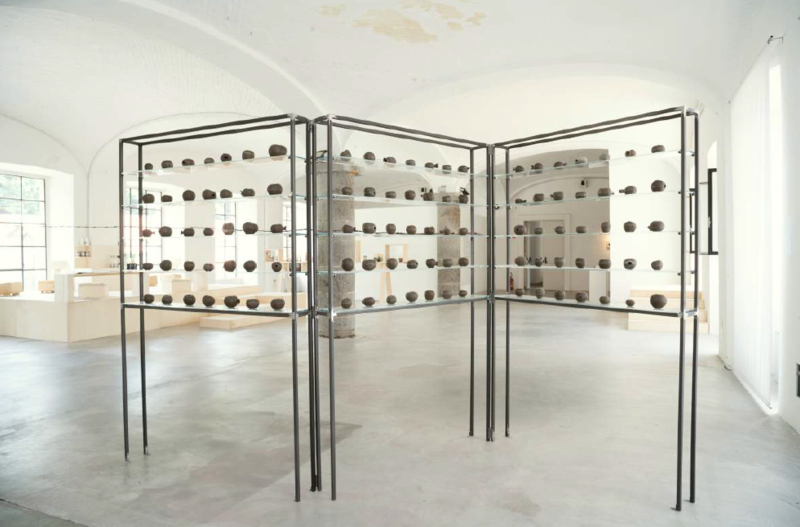 The installation displays the wax reproduction of 105 ancient traditional Piedmontese varieties of apples, some autochthonous some imported, realized by Davide Furno, a wax modeller from Occhieppo Superiore, Biella. The artificial fruits are made from casts of real fruits, following the technique elaborated by the famous 19th century wax modeller Francesco Garnier Valletti and resumed by Furno through bibliographical researches and long experimentations. The 105 “metallic” looking apples are displayed as sculptural objects at different production stages. Visitors are invited to concentrate their attention on the morphology of each variety. The fruits appear as hollow shells, skulls emptied of their contents, remains of organisms belonging to a farming society now vanished. Andrea Caretto (Turin, Italy, 1970, degree in Natural Sciences) and Raffaella Spagna (Rivoli, Italy,1967, degree in Architecture) explore the profound relationships linking human beings to the environment. They conceive art as inquiry, a free way to investigate the multiple dimensions of reality: formal, qualitative and physical quantitative aspects of the matter but also philosophical and social aspects. In keeping with their respective educational backgrounds – landscape architecture for Spagna and natural sciences and scientific museology for Caretto – their projects generate complex installations that simultaneously present the investigation, study, demonstration and experimentation of our relationship with nature. They investigate the relationships linking human beings to other living organisms and inorganic matter, developing projects that evolve over the long term. 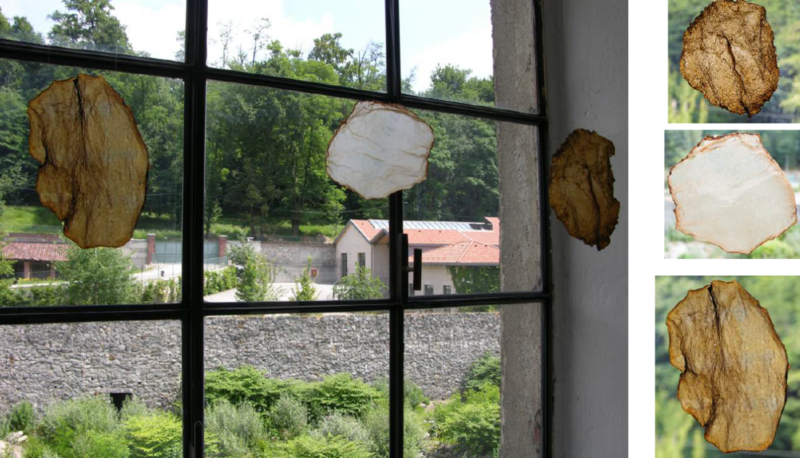 In the last years they have been working on the idea that the form of things (objects, organisms, society, landscape…) could be intended as an emergent property, expression of a relational and morphogenetic field with which the artist has to confront. If forms arise through a process of growth within what is known technically as the “morphogenetic fields”, they would like to consider their art practice and artworks as something that originates from this same field of forces and the artist as one of the morphogenetic agent between the others. Their works, both installations, sculptures, collective actions and performances, always result from “relational processes” in the sense that they emerge from a net of relationships they established with different elements (organic, inorganic, living, etc. ).